This professional dressing table mirror always gives you the best viewing experience, and it can stably stay at any angle you want. 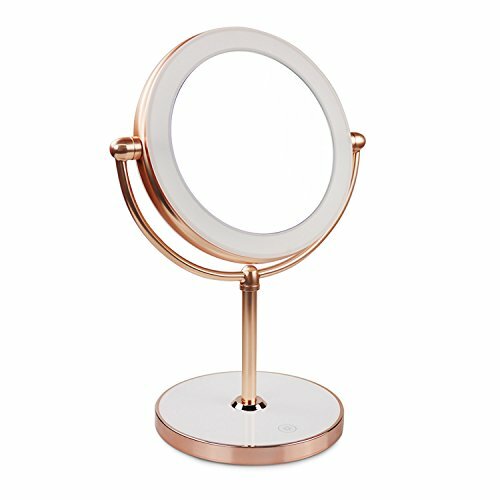 This mirror can magnify 1x/7x details on your face and view every details of your face for makeup, shaving, or deep cleansing. Bulbs reflect true colors and the light source surrounding the mirror does not cast any shadows. 1.The mirror is powered by 1000mAh li-polymer battery,please make sure it is full charged before use. 2.Put your fingers on the power switch on the mirror base,the mirror will be lighted up. 3.Keep your finger on the power switch,you can adjust the light brightness as per your needs. 4.Get your finger off on the power switch,then touch again,the lights will be turned off. 1.The battery-powered mirror is not waterproof.Please keep away from water. 2.Do not use while bathing or in the shower. ❤LED lighting:Eco-friendly and energy-efficient LEDs providing the natural light you will encounter through the day.This lighted make up mirror uses lifetime energy saving LED bulds.Replacement bulbs are required. ❤Touch sensor switch:Brightness is adjustable by touch sensor switch.Keep your finger on the power switch,you can adjust the light brightness as per your needs. ❤Magnifying Mode:7X magnifying mirrors,clear to see details when do makeup,it can makes sure see clearly for your facial features and makeup with each detail perfect. ❤360 degree freely adjustable:It can stably stay at any angle for easy viewing.You can fix it to whatever position you want. ❤Power supply:This LED mirror can be operated by USB cable to make it work, but the mirror itself cannot store power.USB charging more environmentally friendly. If you have any questions about this product by THE D&B CRAFTS LLC, contact us by completing and submitting the form below. If you are looking for a specif part number, please include it with your message.